The team has prepared a sensational holiday spread that’s absolute value-for-money. Indulge in Food Exchange’s daily Festive Buffet lunch and dinner, with their 4 main special highlights available at Fudebar—Traditional Roast Turkey, Roast Ribeye Beef, Salmon Coulibiac and Honey Studded Gammon Ham. You’ll also be glad to know that these highlights are also part of Fudebar’s Festive Takeaways, so you can host the perfect dinner in the comfort of your own home. The restaurant boasts of a gorgeous, spacious interior that is perfect for gatherings with your loved ones, no matter how big or small the group. You can also opt for alfresco dining and enjoy the sights from their scenic infinity pool while you feast on their sumptuous buffet. And as far as buffets are concerned, you can expect freshness, quality and variety offered. It encompasses all sorts of chef’s signatures that fuse together a medley of Singaporean, Indian, European cuisine and more. There are even fresh sashimi and seafood on ice and hot cooking stations that serve up a myriad of roasted meats, freshly made popiah and many many more. Perhaps one of the biggest hunks of ham we’ve ever seen, this isn’t just any regular honey-baked ham. Each carved slice of ham is an honest chunk of goodness condensed in its purest form that even your kids would scramble to have more of. It comes along with garden vegetables, mashed potatoes and roasted pineapples for that pop of fresh sweetness. Honey Studded Gammon Ham is also available for Festive Takeaways at S$88 nett. Like any other good feast, you can’t go wrong with beef. This 5kg roast can be considered a flavour powerhouse, bursting with its natural beef juices. Let your senses take flight with how tender it is with its gorgeously pink interior. So, go on. Help yourself to as many slices as you can! This Roast Ribeye Beef (approx. 5kg) served with garden vegetables, rosemary roasted potatoes, mash potatoes and natural jus is available for takeaway at $98 nett. Salmon aficionados will definitely not want to miss out on Food Exchange’s amazing Salmon Coulibiac. A massive slab of fresh, moist salmon is encased in a perfectly crisp, golden-brown pastry and is baked to absolute perfection. The salmon is accompanied by tarragon beurre blanc, garden vegetables as well as mashed potatoes. The Salmon Coulibiac is also available for Festive Takeaways at S$98 nett. Weighing in at approximately 6kg, this eye-catching table centrepiece is served with turkey stuffing, brussels sprouts, mashed potatoes, cranberry sauce and turkey gravy. Be blown away by the incredibly moist and succulent roast turkey. If your mouth wasn’t already watering while watching the chef make a show out of carving the meat, a mouthful slathered with the hearty turkey jus would be enough to change your perception of dry turkey meat. 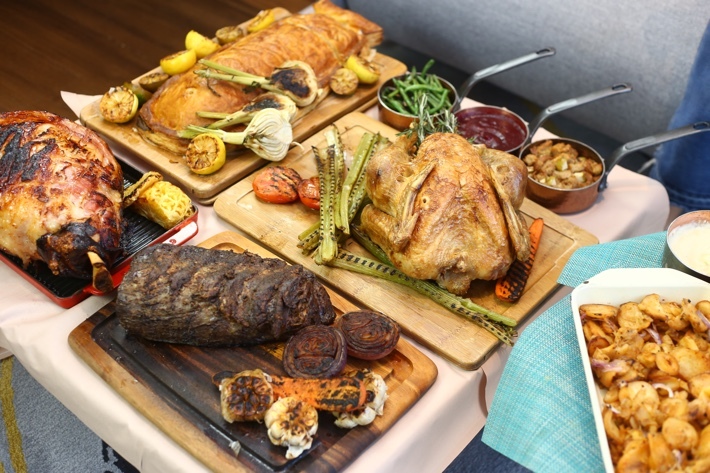 Traditional Roast Turkey is available for Festive Takeaways at S$128 nett. From North Indian tandoori selection with glorious chutneys and curries to local delights (including, but not limited to seafood stir-fry beehoon, chilli crab, satays and laksa), you’d be left spoilt for choice. We’d definitely recommend grabbing some of the Mutton Masala and Cereal Prawns for the ultimate feasting experience. If there’s an obvious indicator that accurately showcases the standard of a buffet restaurant, it would definitely be their live seafood offerings. 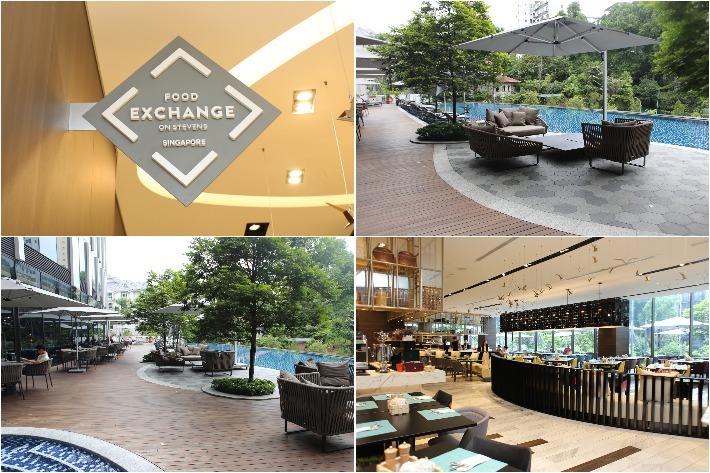 In terms of the freshness and quality, Food Exchange is definitely not one to disappoint. Tuck into a sizeable variety of crustaceans and shellfish from snow crabs, prawns, mussels and scallops, or help yourself to the salmon gravlax that’s presented next to a whole fresh salmon. Remember to save some space for their artisanal desserts, all of which are perfectly sized into tiny bite-sized portions so you can sample the entire lineup available. While they’ve got classics such as chocolate eclairs and cupcakes, the one you cannot do without has to be their durian with sponge cake, which was the most decadent way to end our meal with. Suddenly Christmas feels too far away, and we completely understand that feeling. Fortunately, the wait isn’t long as both the Festive Takeaway and Festive Buffet start on the 15th of November and will go on till the 31st of December. Remember to book before 14th December 2018 to enjoy 25% Early Bird Discount off Buffet at Food Exchange as an extra Christmas gift to yourself. Christmas doesn’t really get any better than this, so whether it’s to snag an eye-catching dinner centrepiece or to stuff yourself silly with so many enticing eats, you’d have to be crazy to pass off this opportunity. So come and celebrate Christmas with Novotel Singapore on Stevens and Mercure Singapore on Stevens! This post is brought to you by Novotel Singapore on Stevens and Mercure Singapore on Stevens.